Dry cereal, juice pouch, and a packet of goldfish. That is breakfast for 3 out of 4 Tucson kids during the school year. In South Tucson, over half of families with children under 18 are impoverished. Food banks and homeless shelters are strained to their breaking points. They are band-aids – they CANNOT solve the problem of persistent inter-generational poverty. What would our Tucson community look like if every adult had a fulfilling career with financial knowledge to manage their money? No poverty, no homelessness, and no children going to bed hungry. 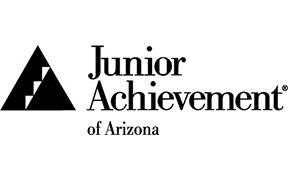 This is the vision of Junior Achievement of Arizona. Our mission is to inspire and prepare young people to succeed in a global economy. JA empowers young people with the skills to succeed in work and life. We give students the knowledge they need to manage their money, plan for their future, and make smart academic, career and economic choices. Our effect is more financially stable families, eliminating generational poverty, forever. In 2016, Victor Moreno was a Junior at Tucson High School. As the only child of a single teen mom, he grew up with the stark reality of poverty. She worked hard his whole life, modeling the best she could for her son but we all know the challenges of starting life as a teenage mom. Fortunately, that year Victor participated in Junior Achievement’s JA You’re Hired program. He learned how to write a resume that HR managers actually want to see, and discovered how to present his best self both on paper and in person in an interview. At the JAYH Challenge, Victor won the highly competitive Interview Challenge. He earned a paid summer internship learning firsthand how to thrive in the workplace. In his Senior year, Victor again seized the opportunity to participate in JA You’re Hired and further expanded his skills in collaboration and networking. To adequately prepare for their futures, our youth need educational programs that provide an understanding of practical workplace readiness skills, personal financial literacy and the academic requirements necessary to pursue their career aspirations. Our schools cannot, and do not, address the issues of workforce preparedness and personal finance. Because of this, educators in our Tucson schools are imploring Junior Achievement expand our reach to fulfill this need.